Rice (Dhan, Chabal) belongs to the genus Oryza (Family- poaceae, 2n=24) is the staple food for more than half of the world’s human population. It is consumed as staple food for about 3.5 billion people across the whole world. Genus Oryza consist of two cultivated species O. sativa and O. glaberrima, and 23 wild species. Among the two cultivated speices O. sativa was dominated in Asian as well as Europe, South America region and O. glaberrima was mostly concentrated into the West African countries only. The Asian rice O. sativa was evolved from wild perennial O. rufipogon and wild annual O. nivaraand wild progenitors of O. glaverrima was O. longistaminata and O. breviligulata. According to Normille (2004) Oryza sativa was first domesticated between 8000-15000 years ago in India and China and river valleys of Yangtze, Mekon rice could be the primary Centre of origin of O. sativa while delta of Niger river in Africa is the primary Centre of origin of diversity of O. glaberrima. Among Asian countries rice production as well as consumption is highest whereas in Sub-Saharan Africa, Caribbean and Latin America, rice consumption is steadily increasing. Rice alone provides about 50% of the dietary caloric supply in around 520 million poor people in Asiatic countries. Rice is grown in 160.6 million hectares across the world with the total production of 738.20 million tones having productivity 3424.41 kg/ha (FAO, 2015). India is the Centre of origin of Rice and it is also the second largest producer of rice just after China. Thousands of ecospecies of rice had been evolved in India from the down of crop domestications. The ecospecies of japonica, indica and javanica have been generally recognized in O. sativa. Numerous rice landraces had been evolved due to random mutations and selection by the ancient farmers since centuries of rice domestications. India has a vast agroclimatic environmental conditions which gives suitable platform for tremendous genetic diversity. National Bureau of Plant Genetic Resources (NBPGR) and International rice research institute (IRRI) have been recorded and maintained more than 60,000 rice landraces of Indian subcontinent still now. India is popular for its native wealth of rice genetic resources and among these the large number of indigenous short grained, scented varieties cultivated in different pocket of various states of eastern India. Chhattisgarh popularly known as “Rice Bowl of India” and two other states namely Odisha and West Bengal have a significant amount of diverse rice germplasms. Almost in all Asian countries, rice is an integral part of festivals and rituals and is has medicinal values too. From ancient Ayurvedic treaties to today’s traditional systems, many folk rice varieties with medicinal values are being used in various States of India to treat and cure various skin diseases, fever, blood pressure etc. Different researchers from different angles have reported various medicinal properties of traditional rice. Various medicinal properties of Indian traditional rice varieties need to be tested and verified scientifically. But the unfortunate aspect is that out of thousands of landraces of rice more than 90% are being extinct from the agricultural fields of India and the remaining are in the way of extinction. Modern agriculture is totally depends upon the production of the new improved high yielding varieties and for that sustainable biodiversity is the basepoint. Overpopulation and Urbanization, climate change and intensive agricultural practice makes agricultural diversity more and more vulnerable and now a days it’s become a disaster for the sustainable biodiversity. A large agricultural region occupied by a single high yielding varieties of rice as a consequence thousands of landraces are being disappeared from the rice field. Farmers are uninterested to cultivate the traditional varieties due to its low yield and unavailability of seeds, but the fact is that so many landraces are still exist which have better yield as well as it require less input in comparison to the HYVs. Modern plant breeding approach is solely depends upon the landraces or traditional varieties because of the important genetic components. Landraces have natural resistance capacity into their genetic component to cope up with various abiotic and biotic resistant like submerge resistant, drought resistant, heat resistant, salinity resistant, resistant to various heavy metals, herbicide resistant, pathogen resistant etc. Modern breeding approach utilized these genetic component for the development of new improved rice variety resistant of various abiotic and biotic stress. Thus for the sustainable agriculture it is necessary to protect these landraces diversity. This book includes the present status of rice biodiversity of the various states of Eastern India. It address about the erosion of rice biodiversity and its likely impact on the sustainable agriculture and livelihood of India. Authors of the various chapters of this book are trying to concern about the importance of the rice biodiversity in modern agricultural systems and why to stop the destruction of the traditional varieties from the present agricultural system. As rice is one of the major staple food of India we cannot underestimate the rice production and for that sustainable availability of HYVs is must. Present HYVs are unable to produce the required yield due the gradual changing environmental condition and for that reason we have to produce new improved HYVs which may compete against the present changing climatic condition. Thus for sustainable production of HYVs we have to protect our rice landraces form which we can get our desire genetic component which can fulfill our requirements. An effort must be made to conserve such unique traditional varieties through proper scientific program and social awareness. Chapter 1 discuss about the current status of rice biodiversity of West Bengal. This chapter also include the morphological characterization of existing traditional rice varieties of West Bengal and their utilization in modern plant breeding approach and concern about the gradual erosion of rice biodiversity and needs of their protection. Chapter 2 deals with the review of various morphological and molecular works done by various researchers and rice breeders of India. Chapter 3 concerned with various biotic and abiotic stress tolerance rice varieties of West Bengal and their utilization in various rice improvement prgramme. Chapter 4 discussed about the nutraceuticals aspects of traditional rice varieties of India. From ancient Ayurvedic treaties to today’s traditional systems, many folk rice varieties with medicinal values are being used in various States of India to treat and cure various skin diseases, fever, blood pressure etc. Chapter 5 explain the role of folk rice varieties in sustainable agriculture and livelihood. It includes, food security and yield can only be achieved by sustaining cultivation of the existing indigenous rice cultivars by pure organic means and by obliterating the use of agrochemicals. Chapter 6 deals with the nutritional and medicinal value of the various folk rice varieties of India. Chapter 7 explain the role of Folk rice diversity relating to biofortification and utilization of folk rice cultivars in bio-fortification programme. Chapters 8 discussed on various bi-products and their utilization of various folk rice varieties. Chapter 9 deals with knowledge on rice biology, especially the evolution, genetics and molecular biology that has been gathered over the past century and is tremendously propelled in the last few decades with the advent of the new technologies, methodologies and collective progression over the globe. Chapter 10 discussed on genetics, evolution and molecular biology of rice plant. Chapter 11 discussed on bio-fertilizer and its role on rice production. Chapter 12 focused on importance of folk rice on sustainable livelihood as well as medicinal and nutritional importance of folk rice of Eastern India. 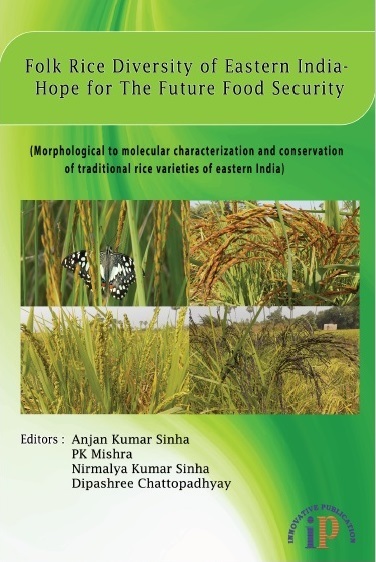 The information offered in various chapters in this book may lead to the sustainable rice biodiversity as well as agriculture of Eastern India. It brings the readers to realize the importance of folk rice diversity and need of their protection. The data will helpful for graduate students, researcher, rice breeders and crop improvement researcher, policy makers. We hope we are able to stop erosion of our valuable genetic treasurer in the form of various unexploited folk rice varieties and fulfill the future requirement of food and also able to stop increasing hunger. Dr. Anjan Kumar Sinha: Experienced teacher and researcher in the field of biodiversity conservation and sustainable agriculture. He has published more than 35 research papers in various National and International journals and book/chapters. He is actively engaged in the conservation of agobiodiversity of Eastern India. Currently working as a Lecturer at Dept. of Botany, Bankura Sammilnai College, Bankura, West Bengal. He has received plant genome saviour recognition award form Protection of Plant Variety and Farmers Right Authority (PPV & FRA), Govt. of India, for conservation of agrobiodiversity of West Bengal. Dr. P K Mishra: Professor and Head, Dept. of Botany, Vinoba Bhave University, Hazaribag, Jharkhand, India. He has over 35 years of experience as a teacher and researcher which is evidenced by over hundred papers, 10 PhDs produced and successfully completed six sponsored research projects. He has professionally trained in scientific researches in the area of biodiversity conservation. He has received many awards and honours from various national and international organizations for promoting environmental awareness among the common people. Nirmalya Kumar Sinha: He is working as Part Time Teacher (Govt. Approved), Dept. of Nutrition, Raja N.L. Khan Women’s College, Midnapore, West Bengal since 2008. He is presently doing his research on community nutrition with special emphasis on maternal and child health of tribal areas. Recently, he has got a UGC-Minor Research Grant from the University Grant Commission, New Delhi. He has published 29 research articles in different National and International journal of repute and one edited book. He is attached with different National and International journals as editorial board member/reviewer. Dipashree Chattopadhyay: Research Scholar at Dept. of Botany, Vinoba Bhave University, Hazaribag, Jharkhand. She has been working on conservation of traditional rice landraces of West Bengal and identification of drought tolerant varieties and their molecular characterization. She has published more than five research papers and book chapters in various National and International journals.